(1853-1890), Dutch postimpressionist painter, whose work represents the archetype of expressionism, the idea of emotional spontaneity in painting. Van Gogh was born March 30, 1853, in Groot-Zundert, son of a Dutch Protestant pastor. Early in life he displayed a moody, restless temperament that was to thwart his every pursuit. By the age of 27 he had been in turn a salesman in an art gallery, a French tutor, a theological student, and an evangelist among the miners at Wasmes in Belgium. His experiences as a preacher are reflected in his first paintings of peasants and potato diggers; of these early works, the best known is the rough, earthy Potato Eaters (1885, Rijksmuseum Vincent van Gogh, Amsterdam). Dark and somber, sometimes crude, these early works evidence van Gogh's intense desire to express the misery and poverty of humanity as he saw it among the miners in Belgium. In 1886 van Gogh went to Paris to live with his brother, a paintings dealer, and became familiar with the new art movements developing at the time. Influenced by the work of the impressionists (see IMPRESSIONISM) and by the work of such Japanese printmakers as Hiroshige and Hokusai, van Gogh began to experiment with current techniques (see UKIYO-E). Subsequently, he adopted the brilliant hues found in the paintings of the French artists Camille Pissarro and Georges Seurat. 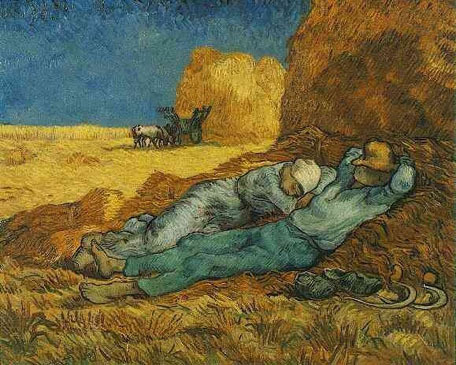 In 1888 van Gogh left Paris for southern France, where, under the burning sun of Provence, he painted scenes of the fields, cypress trees, peasants, and rustic life characteristic of the region. During this period, living at Arles, he began to use the swirling brush strokes and intense yellows, greens, and blues associated with such typical works as Bedroom at Arles (1888, Rijksmuseum Vincent van Gogh), and Starry Night (1889, Museum of Modern Art, New York City). For van Gogh all visible phenomena, whether he painted or drew them, seemed to be endowed with a physical and spiritual vitality. In his enthusiasm he induced the painter Paul Gauguin, whom he had met earlier in Paris, to join him. After less than two months they began to have violent disagreements, culminating in a quarrel in which van Gogh wildly threatened Gauguin with a razor; the same night, in deep remorse, van Gogh cut off part of his own ear. For a time he was in a hospital at Arles. He then spent a year in the nearby asylum of Saint-Ray, working between repeated spells of madness. Under the care of a sympathetic doctor, whose portrait he painted (Dr. Gachet, 1890, Louvre, Paris), van Gogh spent three months at Auvers. Just after completing his ominous Crows in the Wheatfields (1890, Rijksmuseum Vincent van Gogh), he shot himself on July 27, 1890, and died two days later. The more than 700 letters that van Gogh wrote to his brother The (published 1911, translated 1958) constitute a remarkably illuminating record of the life of an artist and a thorough documentation of his unusually fertile output�about 750 paintings and 1600 drawings. The French painter Chaim Soutine, and the German painters Oskar Kokoschka, Ernst Ludwig Kirchner, and Emil Nolde, owe more to van Gogh than to any other single source. In 1973 the Rijksmuseum Vincent van Gogh, containing over 1000 paintings, sketches, and letters, was opened in Amsterdam.